As a medical imaging researcher, I notice when medical imaging technologies are mentioned by popular news media or medical-themed television shows. Lately I’ve been seeing PET imaging mentioned more frequently, including on TV shows like House and Grey’s Anatomy. This probably just reflects the fact that dramatically increasing numbers of PET scans are being performed in real life in clinics and hospitals. So what is PET imaging? Funny that you ask, because I just happen to do research in this field. In this context, PET stands for Positron Emission Tomography. During a PET scan, a trace amount of biologically-active, radioactive drug is injected into the patient’s vein. The drug localizes somewhere in the patient, depending on the metabolic properties of the selected drug. The drug then emits a positron (anti-particle of the electron), and the positron annihilates with an electron in the patient’s body. 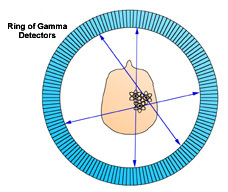 The resulting energy forms gamma ray pairs that pass through the patient and are detected by the PET scanner. These detected gamma ray signals are used to create a 3-D volumetric image or picture of the drug’s concentration in the body. PET imaging technology is unique because it images a patient’s metabolism, whereas most other medical imaging techniques measure anatomical structure. For example, X-ray CT or MRI scans can be used to identify a tumor because they show the patient’s anatomy in detail. However, PET imaging can identify if the tumor is benign or cancerous, by measuring whether or not the tumor takes up the radioactive drug. In reality, you’d really like to know both though — detailed anatomical structure and metabolic function. Recent work has demonstrated the increased clinical diagnostic value of fusing imaging technologies based on function (e.g., PET, SPECT or functional MRI) with those based on structure (e.g., CT, MRI, or ultrasound). As a result, PET and CT scanners are now typically combined into a single gantry system, so that images can be taken from both devices sequentially during a single procedure. Since PET measures metabolism instead of anatomical structure, it is mostly used to image organs whose size or shape does not indicate whether they are functioning properly, such as the brain or heart. It is also used to diagnose diseases that exhibit an abnormal metabolism, such as cancer. Stay tuned this week when I discuss some Alzheimer’s research that utilizes PET imaging. As you know, there was an aborted attempt to bomb Northwest Airlines Flight 253 last Christmas. The explosive (a.k.a., “crotch bomb”) was hidden in Mr. Abdulmutallab’s underwear to avoid detection. In the wake of this attempted terrorist attack, there was a lot of press on using full-body scanners at airport security checkpoints because such a scanner would have revealed the bomb. The news coverage focused primarily on the issue of privacy invasion weighed against the benefit of increased airport security. Usually the news coverage included a frequent flier pleading for us to spend the money on full-body scanners to improve safety. However, I saw very little coverage on the potential health effect of frequent full-body scans. Now as a research scientist, I know just how much paperwork is required to scan humans even for medical purposes. So I know that these airport security scanners must pose very little health risk to humans. However, all the hype did get me curious about the technology used. There are two different technologies used for airport security full-body scanners — millimeter wave technology and backscatter technology. Millimeter wave technology uses low-level electromagnetic waves. The millimeter wave is transmitted from two antennas simultaneously as they rotate around the body at high speed. A person walks into a large portal that resembles a glass elevator, pauses, and lifts his arms while being scanned for about 2 seconds. The wave energy reflected back from the body is then used to construct a 3-D image, which resembles a fuzzy photo negative that is displayed on a monitor in a nearby room. According to the Transportation Security Administration, the energy projected by a millimeter wave system is thousands of times less intense than a cell phone transmission. Backscatter technology projects a very weak ionizing X-ray beam over the body surface. A person stands against a refrigerator-sized backscatter machine as a narrow, low-intensity X-ray beam scans his entire body at high speed. The beam of X-rays is sequentially scanned at a very high rate in the horizontal direction across the person’s body, while simultaneously moving down at a lower rate of speed. The entire scan takes a few seconds. The reflection ( “backscatter”) of the beam is detected, digitized and displayed on a monitor in a nearby room. The images look like a chalk drawing. Many reports have erroneously stated that the X-rays from this backscatter technology penetrate clothing but not skin. In fact, the X-rays penetrate the skin but not much beyond it. However, the dose from the X-ray beam is truly negligible by any standard. It is equal to the dose that you receive from 15 minutes of natural background radiation (such as the sun’s rays). The dose from each scan is less than 10 microrem, which is equivalent to the dose you receive from two minutes of flying in an airplane at 30,000 feet. Or put in another way, the dose from the backscatter scan is less than 0.2% of the radiation received from a medical chest X-ray. Doctors and radiation experts argue that such a dose is inconsequential even for pregnant women. 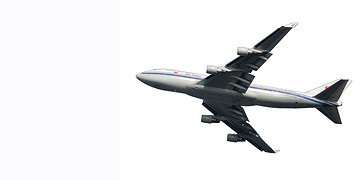 The American College of Radiology states, “An airline passenger flying cross-country is exposed to more radiation from the flight than from screening by one of these devices.” However, these scans do have some limitations in terms of security effectiveness. For instance, these backscatter scanners cannot find weapons hidden in body cavities since the X-rays don’t penetrate much beyond the skin. Presumably the terrorists will adapt to account for the technology. Given the long list above, you’ll justifiably conclude that the blog is a little bit longer than the average science news blog. However, you’ll come away with a more thorough understanding of the topic as a result. It may appeal particularly to scientists, but it could appeal to everyone on topics of specific interest.